The two most popular genera were combined to produce this magnificent hybrid. Brilliant firecracker blossoms explode in deep red, yellow, and shade of deep orange atop a cluster of long, slender leaves. 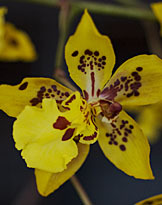 This festive orchid has gained steadily in popularity since its introduction in 1911, and it's not hard to see why. 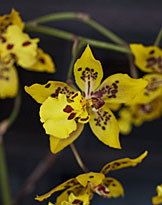 Orchidists refer to this hybrid as Peruvian Oncidium, Odontoglossum, or Oncidium. With beauty such as this, does it really matter? To elevate the beauty of your orchid, this Italian terra-cotta glazed orchid pot is a perfect container for your collection. 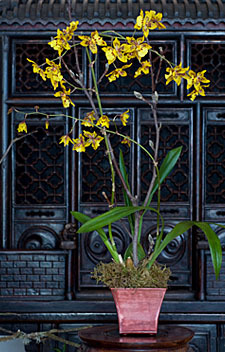 The 6" tall orchid pot is crafted individually in a rustic style. View pot for details or choose below. Plants are shipped in bud approximately 1 week before blooming. The buds will open gradually, growing more spectacular by the day for up to 4-6 weeks. This way, you get to enjoy the full blooming stage of this magnificent plant. Each purchase includes care instructions and an exquisite gift card for your personal message--only from Beautiful Orchids. Enjoy!